Shareba was found in Eternal Sleep lying peacefully by the pond. Shareba is our Foundation mare. She is high percentage Egyptian bred with a champion studded pedigree. The proof is in her foals. She consistently throws beautiful typey heads, large dark eyes and level croups, regardless of the sire. 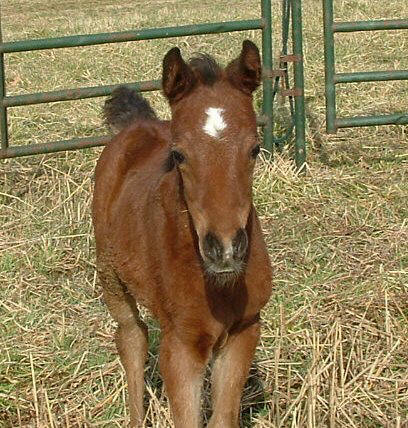 Her foals have all been over 15hh and exhibit her sweet disposition and intelligence. She was in a bad accident in her youth and has not been ridden or shown. Shareba, heavy in foal 2005. Sha Drakkar 1997chestnut gelding by Jonang Jahil. TTT Gazala Ahmar 1999 chestnut filly by Jonang Jahil. Docs Golden Nick 2005 buckskin 1/2 Arabian colt by Docs Makin' Big Bucks (AQHA). Sha Lady Jabella- full sibling to Nick in 2006!